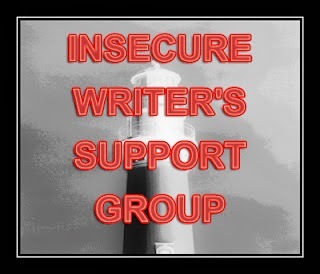 It's the first Wednesday of the month, which of course hails the regular arrival of the Insecure Writer's Support Group, hosted by Ninja Captain Alex J. Cavanaugh. The group offers a place for writers of all kinds to support each other in those ever-present moments of insecurity. One of the things that many writers have in common (especially new writers) is a reluctance to dive in head-first and proudly proclaim themselves writers to the outside world. Often the writer will go to great lengths to excuse this attitude, telling themselves things like, "You're not a real writer until you've been published." They might even relinquish a baby step or two, calling themselves things like "an aspiring writer" or even "a wanna be writer." I've gone on a rant or two in this blog about why I think that's the wrong attitude to have, but I didn't arrive at that conclusion spontaneously. I went through a period in my life where I had trouble calling myself a writer as well. So why is that? Why do so many of us hesitate to outwardly embrace what we do? Well, let's face it. One of the primary reasons is probably because a lot of people in this world are downright judgmental. All of us are, to a degree, and there's no way around facing that when it's do or die time and you get the oft dreaded question, "So, what do you do?" We just know the response some of them give us when they hear our answer will be that vapid look in the eyes that says, "Sure, you're a writer. And I'm an NBA superstar every Saturday at the gym." These are the "small people" that Mr. Twain warned us about. But my question is this: why on Earth should these small people matter to you and your writing? Why would you even begin to instill any kind of gravity in the opinion of one who offers nothing but pessimism and discouragement? These people do not matter. Brush them off your path like abrading chaparral. Step over them without a moment's thought and carry on. Of course, this doesn't just go for perfect strangers and fleeting small talk. Sometimes those small people have very large roles in our lives. Sometimes those most discouraging can be those closest to us. They can be our significant others, our parents, our best friends. They're coming from a good place, but they don't realize just how deep their words can cut. They don't want to see us wasting any of the precious time we have in our short lives. They love and want the best for us, and the long odds of "success" in the world of publishing are no secret. So they tell us we'd be better off pursuing something more realistic, more achievable. They tell us this is just a weekend hobby or a passing phase or something we're just playing at until the fancy leaves and we get over it. They tell us we'll only last as long as the first rejection, then we'll get on with our lives. Well, guess what? They still don't matter, not where your writing is concerned and not where your personal identity is concerned. That might sound cold or calloused when it's aimed at the people you love, but the simple fact of the matter is that we are still us and they are still them. And some of them just plain don't get it and likely never will. You'll drive yourself crazy trying to fight that, so don't even think about it. And damn sure don't let it break your heart. Just keep putting one foot in front of the other. Keep doing what we do. You know what that is. We write. Because we're writers. No small person can belittle that unless we let them. Some really great thoughts in your post. Very sound advice. I have no support from people who are not also writers (i.e. all of you guys), never had any, and don't feel like I need any either. All I ever get, should I talk to them about the fact that I'm a writer -- but I never really do -- then all I get are awkward smiles, silly questions and an affront of misconceptions about what that means. And, of course, at least one piece of uncalled-for advice about how I should live my life. I don't run around telling people I'm a writer, not because I wouldn't believe I am one -- I'm quite certain I am --, but because it's none of their goddamn business and they have no say in it. No one defines who I am except me, and it's my attitude and my actions which offer me certainty. If I see myself as a writer, and I write, then I am a writer. That's absolutely the right attitude to have. It sounds to me like you've already assessed and stepped over all of the "small people" in your life a long time ago. And if any more come creeping along, you know just how to handle them! That last line says it all! Only small people will put us down, and that goes back to their insecurities, jealousies, and apathy. Great attitude, JW! Lots of positive vibes this morning for the IWSG. Thanks so much, Alex! You're absolutely right. Nine times out of ten, the reason for someone turning their nose up at someone else's ambitions is insecurity about their own. Awesome reminder! I've only recently started taking the plunge and boldly calling myself a writer to other people. The hard part (still) is when they ask what I've had published, and I have to say that I'm still working on that part. Even when they are kind about it, I still feel like a fraud! Curiously enough though, I find that the bolder and more confident I am when talking about it, the more apt people are to respect my writing. It's all in how you present yourself! Definitely! If you let your insecurities creep into the way you outwardly express yourself about writing, it's only going to impede you. And any "small people" you happen to come across will jump right on that! That step of admitting to others that you're a writer is a big one--but you have to believe it first! Me: I write short stories and am working on a novel. Them: So, what have you published? Me: I said I was a writer, not a publisher. Great, positive post. This is a wonderful attitude to live by when it comes to our writing. We each write for different reasons and when someone feeds us negative vibes, it can hurt to the soul. Keep up the positives! That's a great response! The more I think about that typical exchange that we have with people, the more weird it is to me. I mean, if someone tells you they're a stock broker, you don't ask them how much money they've made their clients or something. It's interesting that writing is seen as something in every day conversation where it's okay to basically ask for an assessment of someone's success in their career. Weird! I often find myself obsessing over one stupid, nasty comment that some insignificant person said rather than concentrating on the opinions of people I actually respect. I think we all do that sometimes. I really have to shake myself at times. This is a great quote to live by. Definitely! Words are just words, especially when they're uneducated words, but it's tough to remind ourselves of that, especially if it's coming from someone we care about. Mark Twain also wrote: Everybody is a crank until they succeed. Little people put others down. Giants reach down and pull up those behind them to their level. Great post. That's another great quote, Roland! Mark Twain was an inspirational man, for sure. I've never met anyone who wasn't insecure, and the least insecure-seeming people are usually secretly the most. Being unsure? That's normal. Doing it anyway? That's how you end up being successful. Ever read the proliferation of New York Times bestsellars who wax eloquent about how they're constantly nervous of "what if it isn't good enough" with each and every new novel? Because yeah, we're all human. People who prey on others' insecurities are like the grunge at the bottom of the refuse bucket. They'll make you think that you're the only one, that your insecurities mean you don't deserve to succeed. Really what they want is for you to not outshine them, but as long as you don't let them stop you, you can't avoid doing so! Spot on from top to bottom! We all harbor insecurities. As you said, those that use the insecurities of others for their own gain (and it's usually just to distract themselves from their own) are the lowest of us, and don't deserve a second thought. Very well said, Juturna! Thanks so much for the comment. What an inspirational post! Usually I skip right over the uplifting IWSG posts (not because I'm a negative grump, but because I want to offer support), but this one really stands out. Sincere thanks for saying this in a way that makes so much sense to me! No problem, Jeannette! Thanks so much for the compliment. I'm glad you enjoyed it! Sometimes it's easier said than done! A friend might think they're coming from a good place with negative comments. But a lot of times, the people that put us down do it only to make themselves feel better. Those are the ones we have to dowse out and free ourselves of. You're very welcome, Lauren. And you're absolutely right; it's also important that we take care not to become one of those small people ourselves. Love that quote. Reminds me of sports -- let how you play talk for you. The truly gifted athletes don't need to tell people how great they play. That's definitely one way of looking at it! Thanks for the comment, Barbara. No problem, Krystal! I'm glad you were able to take something from it. Sorry to hear about your fight with your sister. You know how to handle that--stay true to the path your on! Good luck. Yeah, this is an awesome post! Well said, man. I hate that dreaded question, "So, what do you do?" I guess what I do is all that matters, as if I'm only worth what I can do. What kind of stupid society do we live in? Anyway, I've learned to just not say anything about being a writer until I can say I have a book out there for them to SEE. It's not that I don't think I'm a writer. I WRITE, so, of course, I'm a writer. But, no one sees me doing it, and, thus, they don't feel the truth of that unless they can get on their computer and see my book in the Amazon storefront. Then, it would be real to them. This is just how I have to deal with people (like my older brother). But, I agree with everything you wrote. I don't let anyone's words discourage me. I don't even tell them anything, but I will when I've got a finished product. Sometimes it's definitely easier to just avoid the topic altogether with people you know aren't going to give you their support. You don't necessarily need to shout "I'm a writer! Who's got a problem with that?" from the highest hilltop you can find. What's important is being true to yourself about who you are and what you are, despite the detractors trying to drag you down (whether they realize it or not). This. So much this! I've been one of the lucky ones who hasn't had to face the naysayers and small people that you talk about here. If I come across someone who has had to face that, I try to encourage them as much as possible, letting them know that not everyone is like that. Most of the writing community is supportive, it's those people outside, jealous of our goals and how well we know ourselves and what we want, that try to push us down. Small people indeed. Absolutely! You're right that most of the writing community is supportive, though the occasional small person sneaks in. "Small people..." I feel sorry for them. How sad that some can go through life feeling as petty and low as they do. I wish there was something I could do to help such people, but some of them...there is no helping. I'll keep trying because I am stubborn and overly chipper and see what progress I can make, but when their freedom and negativity goes past my nose, that's when I call it quits. Thanks so much, Randi! I agree; small people are usually utterly pitiable. It's a shame they end up taking their insecurities out by stoking someone else's. All we can do is move along and disregard them in most cases.